Unfortunately (or fortunately, for me) I’ve no experience with outboard DSP or noise cancelling devices because I live in such an RFI-free area. I know this reader already has a Wellbrook Loop, but he’s looking for a way to even increase noise mitigation further at his home listening post. Post Readers: Can you help guide him? Please comment with your experience. Is a product like the Timewave or BHI the next logical step? If not, what is? This entry was posted in Accessories, AM, Antennas, Mediumwave, News, Shortwave Radio and tagged BHI, BHI Compact In-Line Noise Elimination Module, DSP, Noise, QRM, Radio Frequency Interference, RFI, Timewave ANC-4 on April 5, 2017 by Thomas. 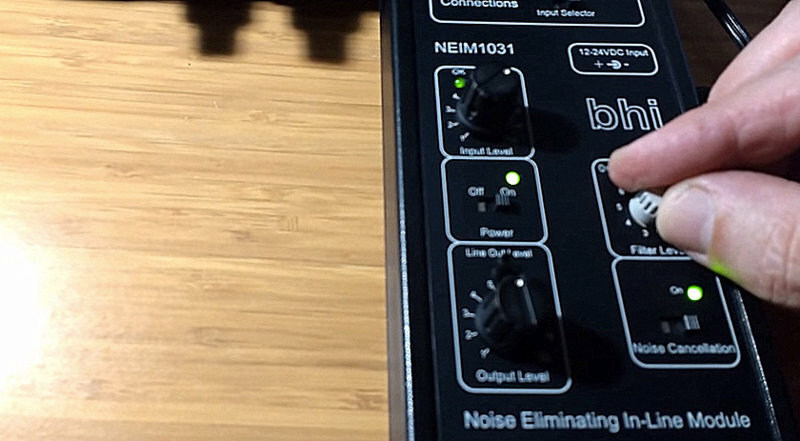 [Recently] one of your contributors mentioned that he purchased a BHI DSP unit at a discounted price. I purchased one (a different model to the one in the previous post) some months ago before I headed away travelling. The post reminded me that I had made a small video demonstrating the DSP unit on my FRG7. The video shows me tuning the DSP on a broadcast of Voice of the People on 3912 khz. While QRM at my place isn’t too bad, it’s still present and the DSP does aid in clearing up a signal. Voice of the People is usually jammed by the DPRK and the DSP also assists in reducing the roar of the jammer. Of course one can go to far with DSP and the audio can suffer from that underwater sound. Thank you, Phil! The FRG-7 is an ideal receiver for something like the BHI module since it precedes on-board DSP. The great thing about an in-line module, of course, is that it can be used with a variety of receivers. Click here to view the BHI NEIM1031 MKII on BHI’s website. This entry was posted in Accessories, News, QRM, Shortwave Radio, Videos and tagged BHI, BHI NEIM1031 MKII, DSP, Phil Brennan, QRM, Shortwave Radio, Yaesu FRG-7 on September 8, 2016 by Thomas. Hailing from Germany, the KWZ-30 communications receiver was one of the first DSP receivers available. This collectable and high performance receiver is rarely seen for sale, but one is now available for a $1890.00 Buy-It-Now price from a Russian Ebay seller. Even with the few dings visible on the radio’s case, it’s likely worth the asking price to a collector. The extensive Fenu-Radio web site has a nice capsule review of the KWZ-30, including some excellent photos. At the $1890.00 price of this KWZ-30, you could buy a dozen SDRPlay receivers, or roughly a couple of the highly rated Perseus SDRs. Assuming available funds, is the KWZ-30 a receiver you would add to your radio shack? If so, why… or why not? This entry was posted in Manufacturers, Radios, Vintage Radio and tagged DSP, Guy Atkins, Kneisner Doering, KWZ-30, vintage on May 31, 2016 by Guy Atkins. The Professor recently sent me a link to the ShouYu SY-DP-330–stating it must be the “big brother” of the ShouYu SY-X5. Indeed it is! The DP-330 sports all of the features found in the SY-X5. It is very large in comparison, though, and runs on four D batteries. The DP-330 even comes with a remote control–most likely for the built-in MP3 player. 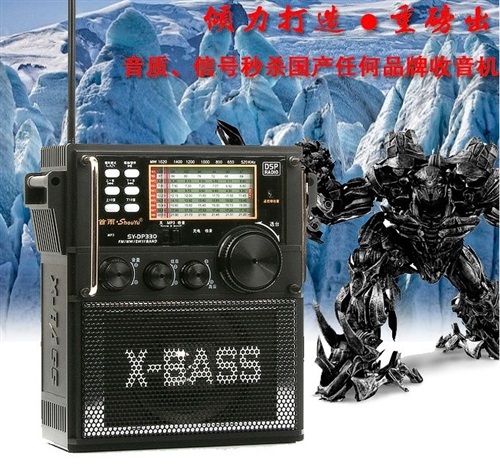 On a side note, the DP-330 is in the only shortwave radio advert I’ve ever seen that also features a giant mega-mechanical monster robot. Classy! Do any readers have the DP-330? Please share your comments. This entry was posted in New Products, News, Radios, Shortwave Radio and tagged DSP, ShouYu, ShouYu DP-330, ShouYu SY-DP-330 on January 28, 2014 by Thomas.